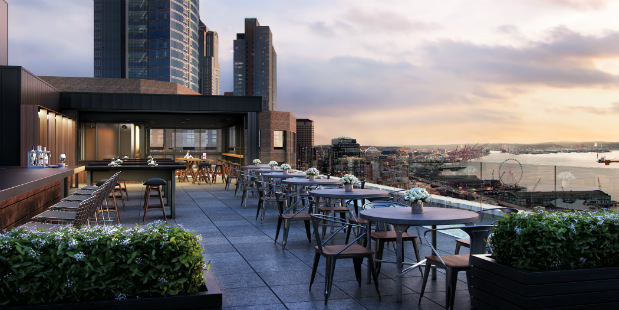 Featuring a sleek design by renowned local architecture firm Olson Kundig and 158 luxe rooms, Thompson Seattle has opened near Pike Place Market just in time to accommodate summer’s influx of visitors. And perhaps more importantly for locals, the hotel’s swanky rooftop bar and lounge, The Nest, has opened just in time to provide a spot for whiling away the warm evenings, taking in panoramic views of Puget Sound with a cocktail in hand. The Nest’s menu of shareable small plates was created by chef/restaurateur Josh Henderson’s Huxley Wallace Collective, which is also behind Thompson Seattle’s eagerly anticipated restaurant, Scout.